10.2 miles Alpine path "Churer Höhenweg"
You're traveling a distance of 34 miles on this strenuous trail. This makes it a relatively long bike trail. 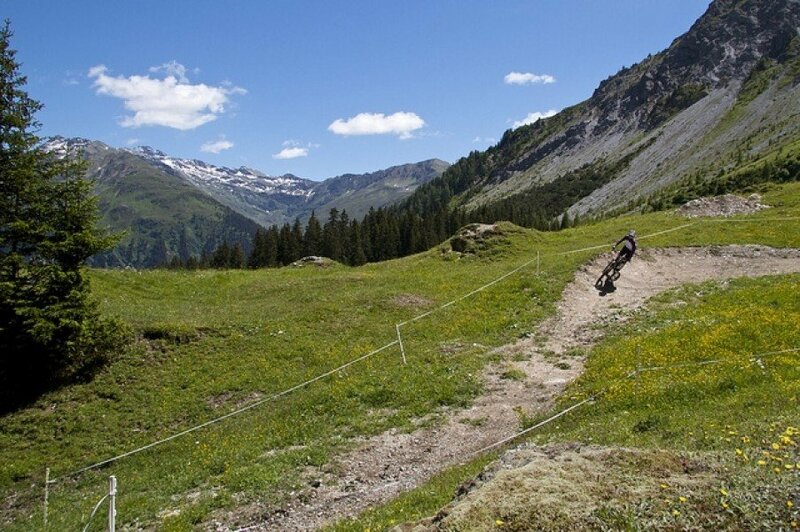 The average length of all bike Trails in Grisons is 25 miles. The tour starts at the valley station of the Grüsch-Danusa mountain railways. Along the Landquart, the tour contains both ascending and descending single trails to Schiers. You'll comfortably continue to Pragg Jenaz. Just before the station you'll turn right into the Furnastraße. The paved road will take you to the mountain village Furna. For overcoming the steep ascent you'll be rewarded with a panorama view on the Rätikon mountain range. On the mountain passage, the tour continues uphill through the ski region to the alp Rona. A beautiful single trail leads to Scära. From here, you'll be cycling steeply downhill until the tour runs into in the Alpine path in the direction of Stams. Through the Maiensäss settlement Stams as well as the villages Says and Trimmis the tour reaches the Rhine. Along the Rhine, you'll be cycling to Zizers, then turn from the Neulöserweg onto the Altlöserweg to get to the palace Marschlins in Iglis. The Gandastraße leads comfortably through the narrow Chlus back to the starting point. On the Swiss motorway A13 you'll exit at Landquart. From Landquart on you'll stay on the Kantonstraße 28 until you get to Grüsch. Take the exit at Grüsch and turn right to Au. Between the restaurant Sportis and the ice rink you'll find free car parks.